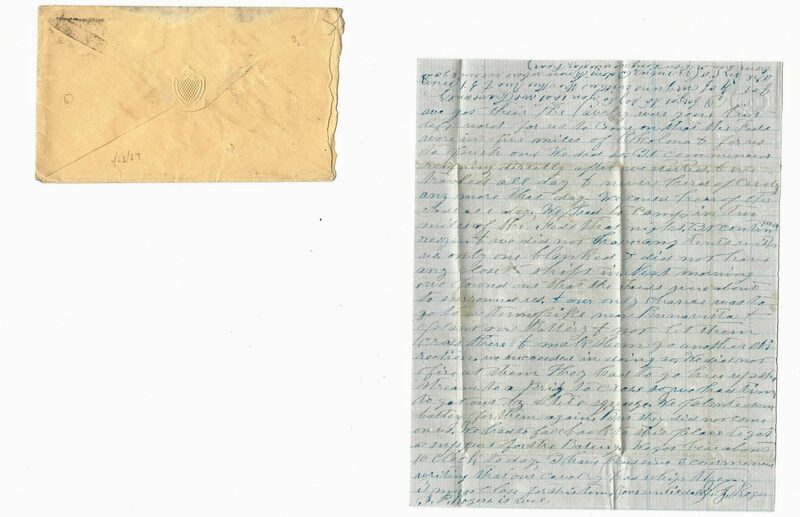 Nine (9) Civil War era letters of Corporal William J. Rogers, Owen's Battery or Monticello Artillery, Arkansas Light Artillery, 10 items total. 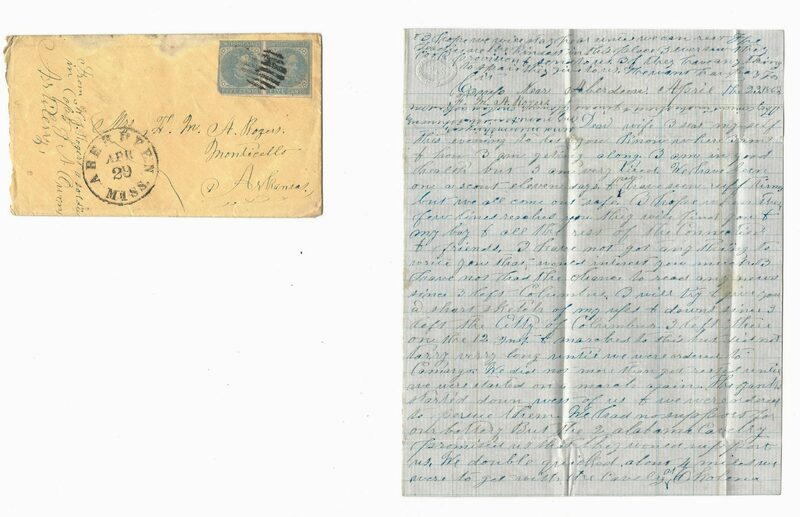 The letters are addressed to Francis M. A. Rogers, his wife, from locations in Tennessee and Mississippi where the company was active, dated March 11, 1862-April 23, 1863. Rogers' letters include references to battles and events that occured during his service, including the Battle of Pea Ridge, the Battle of Island Number Ten, the capture of the [USS] Queen of the West and the [USS] Indianola, the First Battle of Franklin, the Siege of Corinth, the Siege of Port Hudson, the Capture of New Orleans, the Battle of Fort Jackson, the events two years prior to the Battle of Fort Pillow, and more. 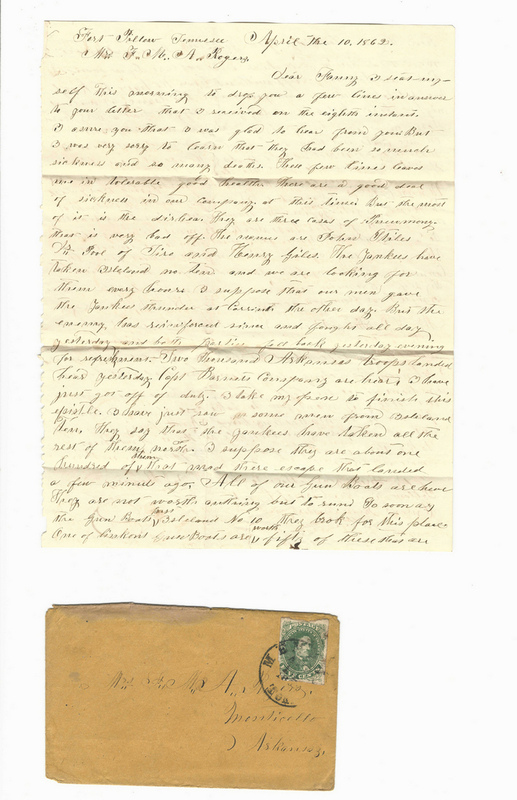 His first letter addressed from Fort Pickering, incorrectly identified as Fort Pickens by Rogers, Shelby County, TN, March 11, 1862 refers to the recent Battle of Pea Ridge, also known as the Battle of Elkhorn Tavern, stating: I heard very bad news this evening Generals [Benjamin] McCulloch and [James McQueen] McIntosh were both killed and General [Sterling] Price wounded in his arm…the Battle was fought in Benton County Arkansas. We also had a fight on the Potomac in which our side worsted [sic] them a gooddeal… Rogers also alludes to the involvement of African Americans in the Battle of Island Number Ten, writing: They are taking negroes by hundreds up to Isleland [sic] no 10 to fortify it…. 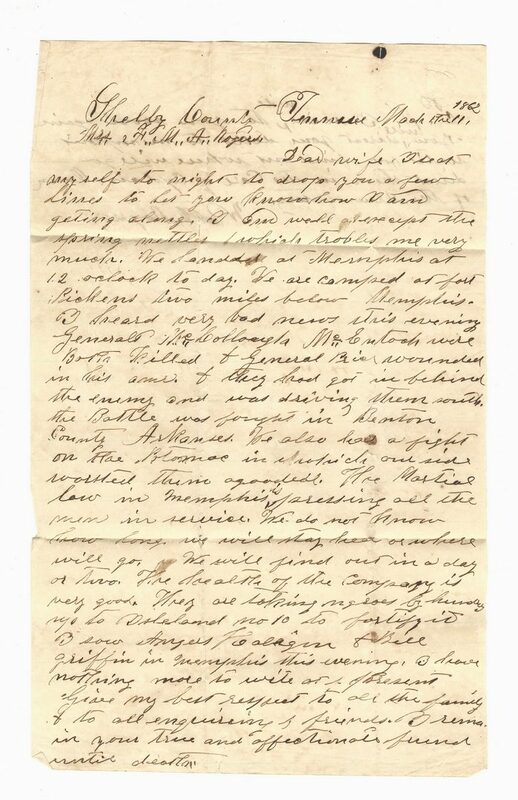 In a letter written from a camp near Columbus, MS, March 13, 1863, Rogers states: We have taken two of the Feds gun boats the [USS] Queen of the West & the [USS] Indianola. 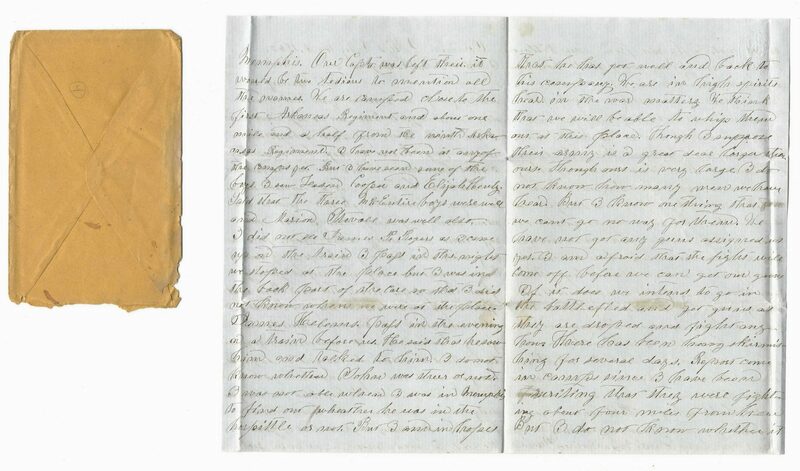 General [Earl Van Dorn] had a fight not long ago not far from Franklin in Tennessee & taken 2200 of them prisoner…. 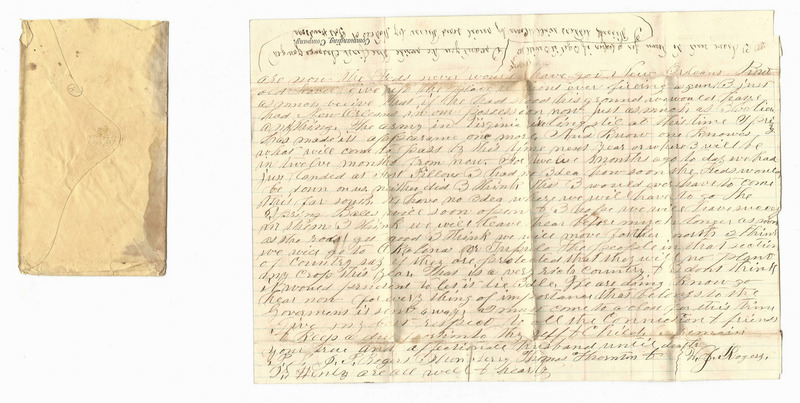 Days later, still stationed at a camp near Columbus, MS, March 26, 1863, Rogers writes: We got a dispatch yesterday evening stating that the Feds under took to pass Vicsburg [sic] yesterday morning and our guns sunk on of the Gun Boats & cripled another very bad so they had to succum [sic]. 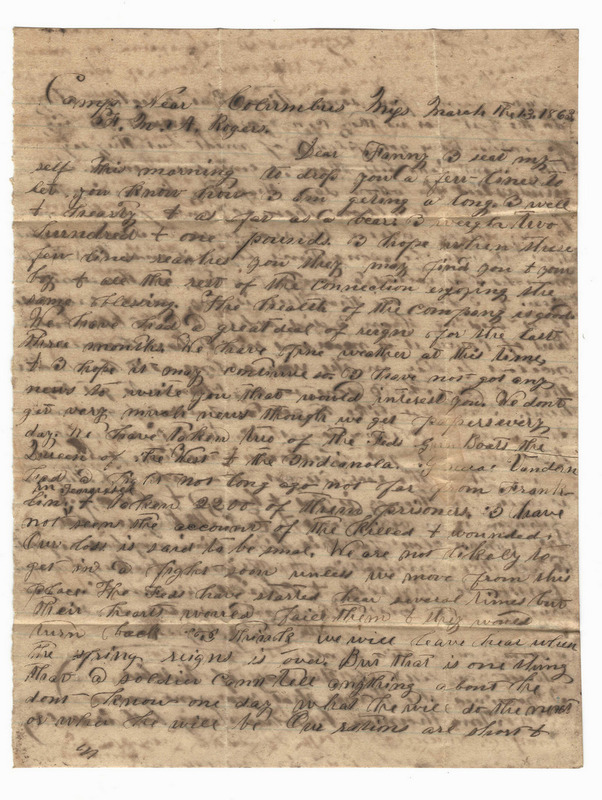 They had fights at Port Hudson about two weeks back. One of the Yanks boats got burned up &one other that was shot all to pieces it had to fall back. Loss on our side was nothing at all. They took 37 men prisoners. They also had a fight at Fort Pemberton about the same time. We were successful there two [sic]. They had to skedadle with their Gun Boats there two [sic]…. 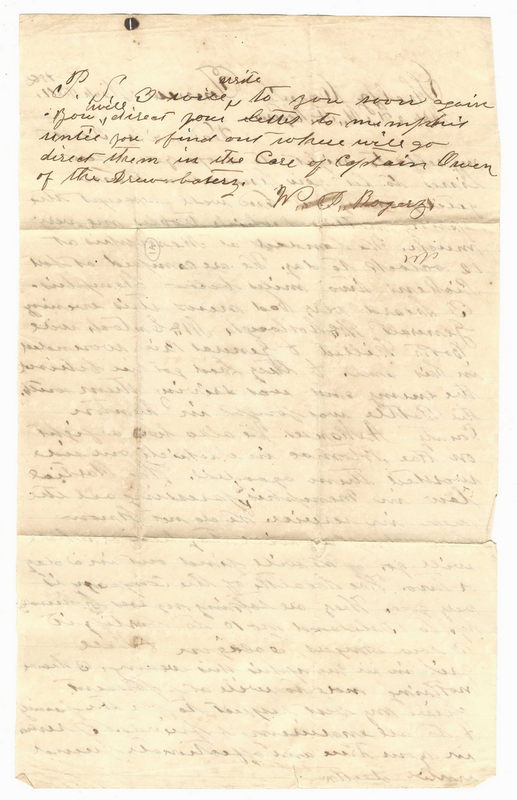 Rogers continues, offering his criticism of the Capture of New Orleans by the Union, stating: If our men had been as resolute last spring as they are now the Feds never would have got New Orleans. 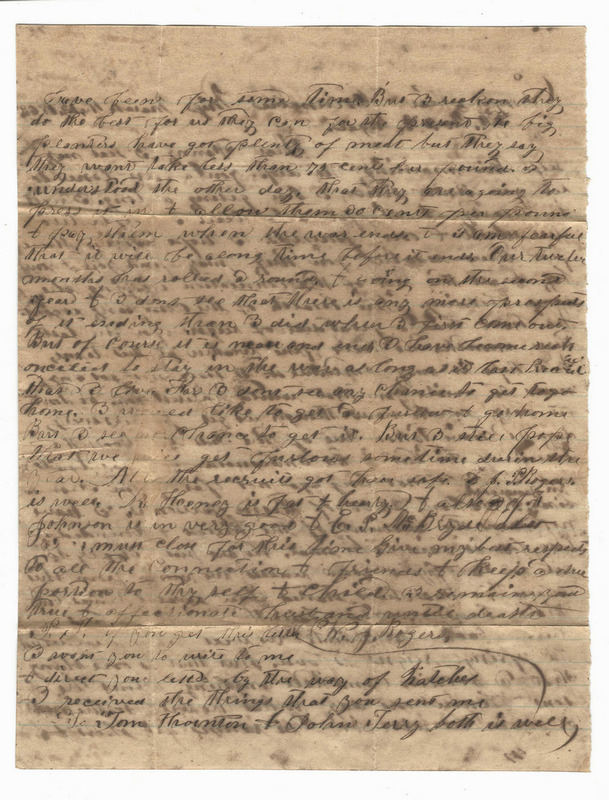 But old [Mansfield Lovell] give up the place without ever firing a gun I just as much believe that if he had stood his ground [we] would have had New Orleans in our posession now just as much as I believe anything…. 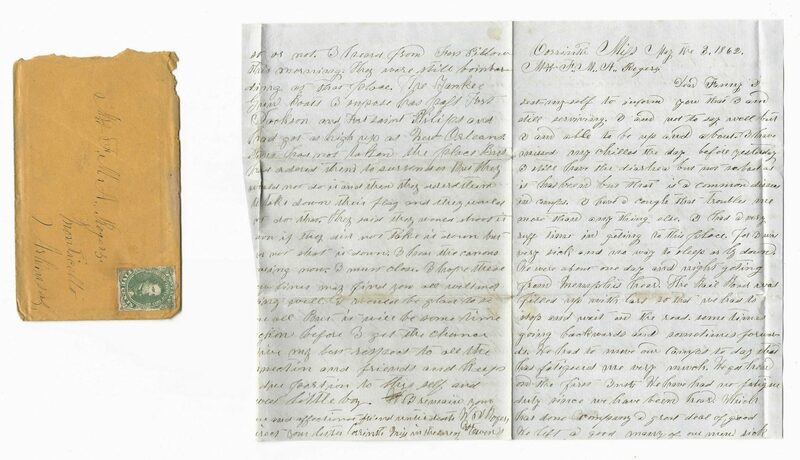 Writing from Fort Pillow, TN, April 10, 1862, two years before the The Battle of Fort Pillow, also known as the Fort Pillow massacre, April 12, 1864, Rogers states: The Yankees have taken (Isleland) [sic] no (Ten) and we are looking for them every hour. I suppose that our men gave the Yankees thunder at Corrinth [sic] the other day…Two thousand Arkansas troops landed hear [sic] yesterday. Capt. 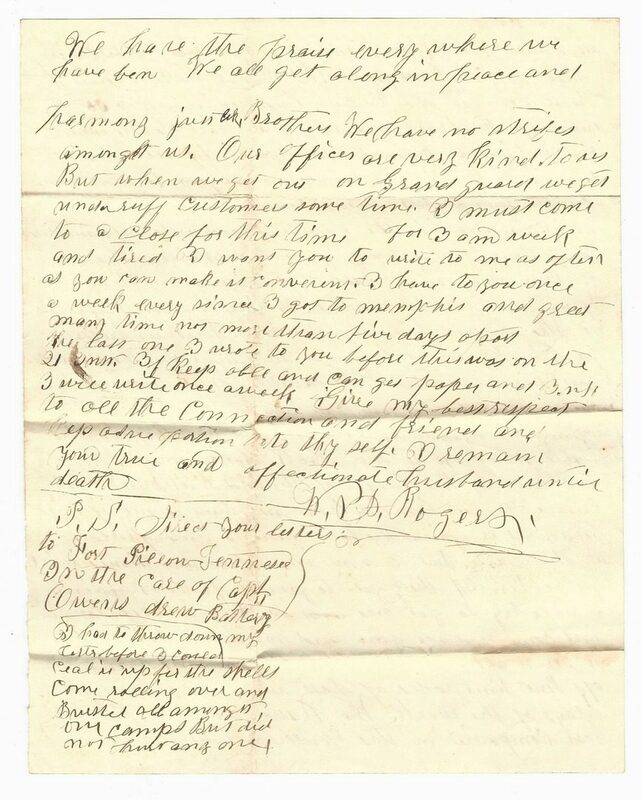 Barnets Company are hear [sic]…I have just saw some men from Isleland [sic] Ten. They say that the Yankees have taken all the rest of them north. I suppose they are about one hundred of them that mad[e] there escape that landed a few minutes ago. All of our Gun Boats are hear [sic]. They are not worth anything but to run So soon as they Gun Boats pass Isleland [sic] No 10 they brok[e] for this place. 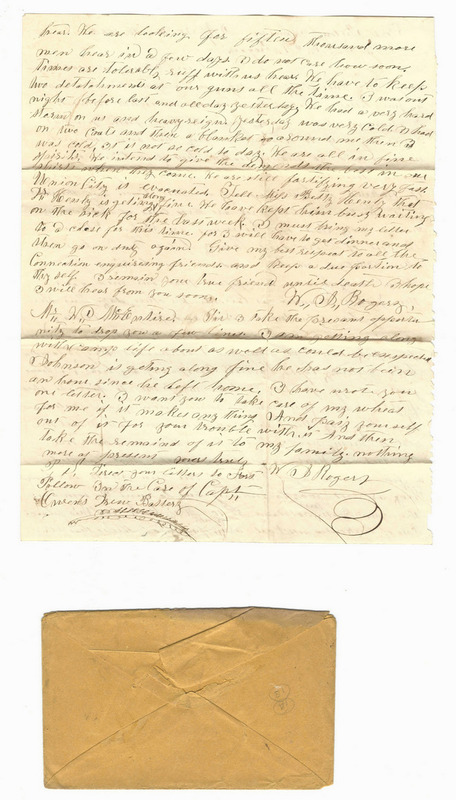 One of [Lincoln's] Gun Boats are worth fifty of these that are hear [sic]. We are looking for fifteen thousand more men hear [sic] in a few days. 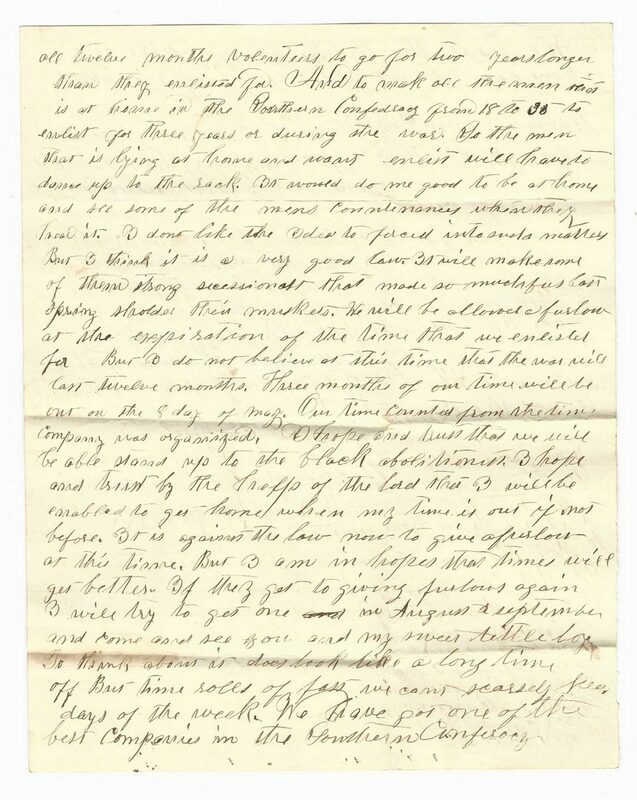 I do not care how soon….. Another letter from Fort Pillow, April 26, 1862, Rogers discusses the positions of the Union Army on the river near the fort, writing: The Yankees stay behind aboard in the river and we can not tell the effect of our shells. But it appears that they are afraid to come around so that we can see them. Two of their men deserted and hailed one of our boats the other day They say when they came down they brought twenty thousand men with them. and [sic] (aimed) to storms [sic] us but they found out they could not do it and they have sent their men up Tennessee River. They say that they have nine (Mosler) Boats and eight gun boats and forty transport boats and about nine hundred men besides them that was on the boats. From what I can learn they expect a big fight at Corrinth soon…They commenced fighting at Fort Jackson the same day that the Yankees made there [sic] appearance at this place. 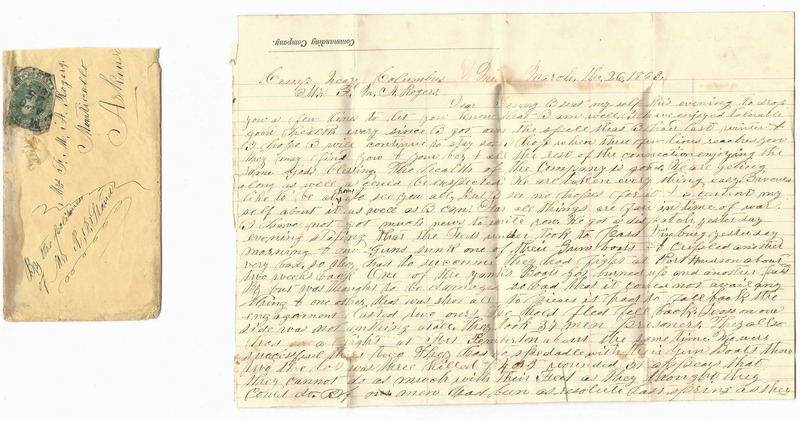 Henry Berk landed hear yesterday he said the telegraph to Memphis (that) the Yankees had taken Fort Jackson but I dont [sic] believe it…… In the same letter, Rogers also discusses the health, welfare, and morale of his company, stating: There is a good deal of sickness in the camps. There are about forty sick in our Company at this time. But there has been no deaths in our Company. Some has the measels some the diarhera [sic]. Some bad colds and one case of slow fever…One of our men got his leg shot off ther [sic] day. He is doing very well I think he will get well. His name is Brown. Another man got his left arm shot off and his right arm broke. I do not know what Company he belonged….. In a letter written from Corinth, MS, May 3, 1862, Rogers mentions that despite illness in the camp: We are in high spirits hear [sic] in war matters. We think that we will be able to whip them out at this place, regardless of the fact that: We have not got any guns assigned us yet. I am afraid that the fight will come off before we can get our guns. If it does we intend to go in the battlefield and get guns as they are dropped and fight any how. 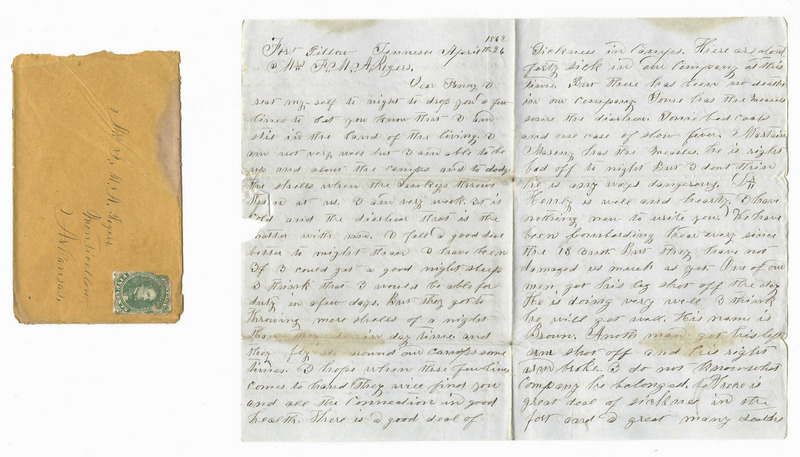 Each letter includes inquiries about her life, their son, information and well wishes for family friends and relations, and pleas for his wife to write to him with directions regarding where she should send her letters, many of them: in the care of Capt. [James A.] Owens, ending his letters with the sentiments: I remain your true and affectionate husband until death. W. J. Rogers. 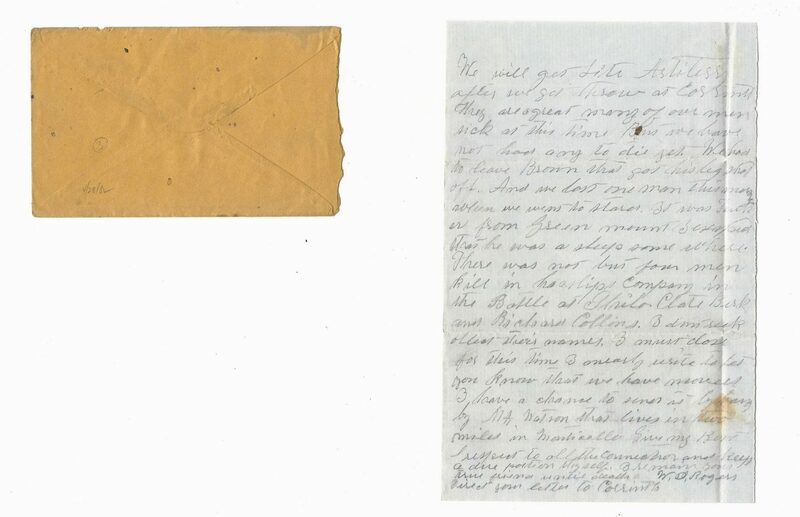 Envelopes included with seven letters, addressed to: Mrs F.M.A. 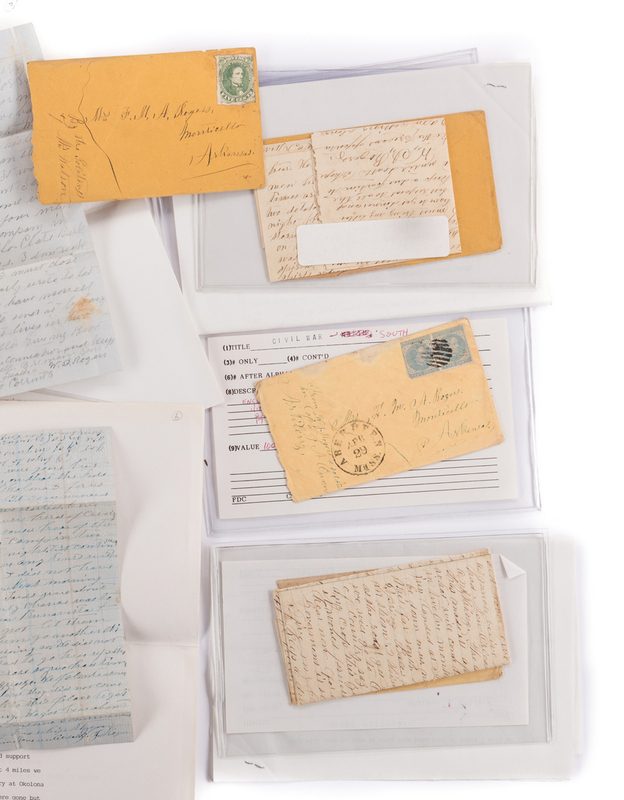 Rogers, Monticello, Arkansas, each with one or two Five Cent Jefferson Davis stamps. Eight letters include typed transcriptions; one letter from a camp near Columbus, MS, dated Dec. 21, 1862 is in fragile condition and has not been transcribed or examined for content. 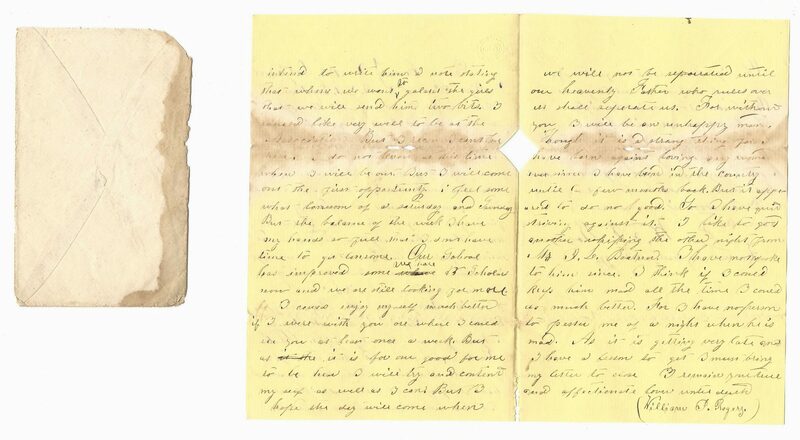 Also includes a love letter written by Rogers from Drew County, AR, to his future wife, Miss Francis M. A. Goodwin, Green Mours, AR, dated Oct 12, 1838, with envelope. 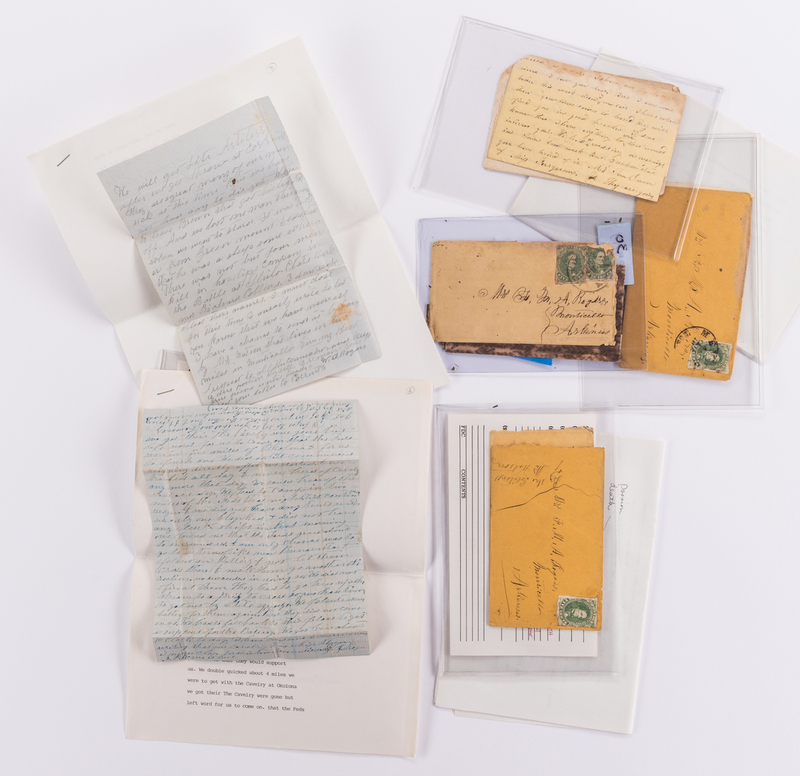 Letters and envelopes housed in plastic sleeves, approx. 5 1/4" H x 8" W. Envelopes approx. 3" x 5 3/8" W. Transcriptions – 11" H x 8 1/2" W. CONDITION: Overall very good condition considering age. 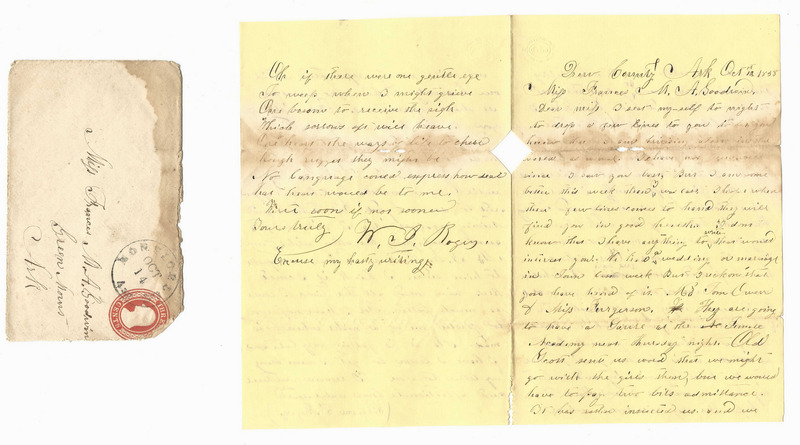 Heavy dampstaining, Dec. 21, 1862 letter. 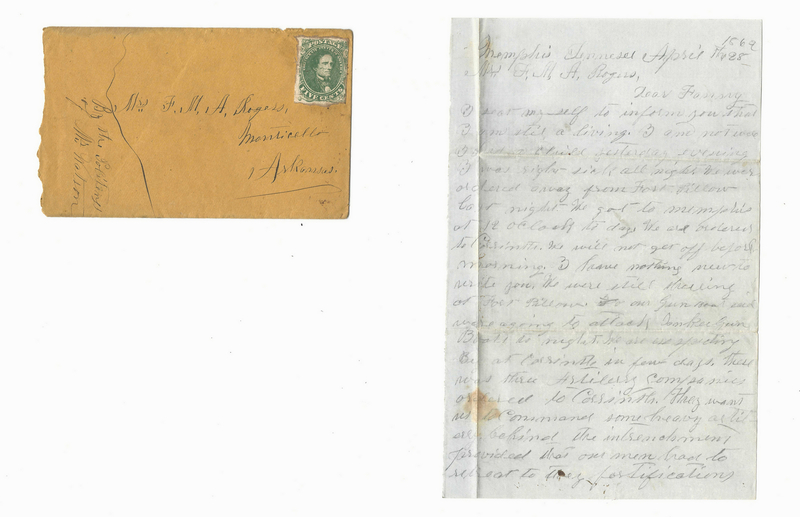 Areas of dampstaining, fading, top horizontal crease of Oct 12, 1838 letter and envelope. Ink bleeding, front and back of March 13, 1863 letter.